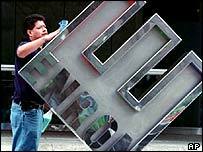 Four former Merrill Lynch bankers have been charged with taking part in the securities fraud at the energy giant Enron. It is alleged that the four men deliberately conspired to help Enron disguise the true state of its financial affairs. Their involvement in the scandal centres around the purchase and resale of Nigerian electricity barges. The Securities and Exchange Commission (SEC) believes this was a deliberate ploy to conceal debts. The four men deny any wrongdoing. The SEC said the charges underline its commitment to protect investors from future deceptions. "This action is a message to all who would help...a company commit fraud: we will bring the full weight of our enforcement arsenal against you," said SEC chairman William Donaldson. The charges are the latest in a tidal wave of litigation since Enron admitted falsifying accounts in November 2001. So far the US Justice Department has filed charges against 160 people, notably the company's former chief financial officer, Andrew Fastow, who faces 78 separate indictments. Lawyers, auditors, banks and stock analysts have also all been under fire because of their involvement in the case, and accountancy giant Andersen was forced out of business. Merrill Lynch said in a statement that the SEC had approved a previously announced $80m (£51m) settlement which it hoped would draw a line under the company's involvement in the Enron scandal. Merrill Lynch has neither admitted nor denied any wrongdoing.